It's not enough to simply exist. Living a vibrant and healthy life is essential. The pursuit of optimum health must focus on absolute vitality, not just avoiding illness. Physical and mental balance along with a healthy diet are key. Achieving this vibrant state of being is an all-encompassing and extremely complex journey, requiring a multifaceted approach. Featuring eight complete wellness blends with 46 targeted nutrients, Pulsate Plus enhances and supports the mind…body…heart. quality product development. It incorporates our expertise in chelation and trace mineral technology, along with the natural health benefits from the beehive. Health claims for nutritional supplements are strictly regulated by the Food and Drug Adminstration. Pulsate Plusis the only liquid, dense-carotenoid supplement formulated with scientifically proven ingredients, including NatraStatinTM plant sterols which may lower both Total and LDL Cholesterol and reduce the risk of Heart Disease, when combined with a diet low in saturated fat and cholesterol. Cardiovascular support is only one of a multitude of benefits Pulsate Pluscan deliver when added to your daily regimen. A single ounce is a good daily source of soluble fiber providing a powerful ally in the areas of cardio, digestive and overall wellbeing. 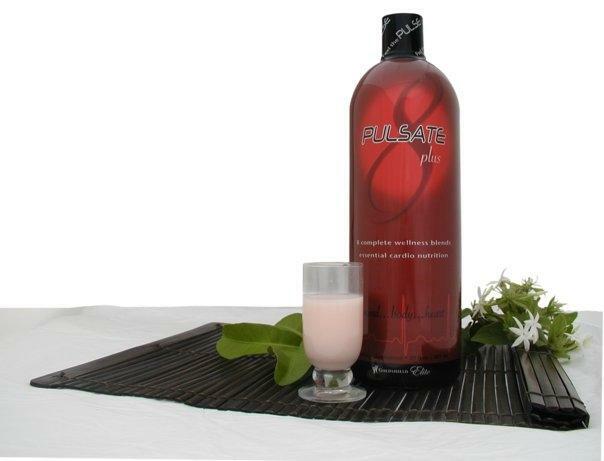 Pulsate Plus, positioned in a market which predominantly features antioxidant fruit juices, far exceeds the competition. The majority of these juices have a high sugar content, focus on an extremely limited collection of nutritional factors and rely heavily on one basic antioxidant. Antioxidant-rich Pulsate Plus, which is low in sugar, contains Mangosteen, Noni, Acai and Goji but is far superior to any fruit juice supplement. The addition of NatraStatin plant sterols, Sea Buckthorn, B vitamins, fiber, Larch, Rhododendron Caucasicum, and Resveratrol are a few of the potent ingredients which push Pulsate Plus to the forefront of the wellness industry. Whether your journey begins with the search for energy, enhanced performance, cardio improvement, immune fortification or mental clarity, Pulsate Plus delivers. The cornerstone to vitality and complete wellness for your mind, body and heart begins with Pulsate Plus. "I love Pulsate Plus. It gives you what you need all at once. After taking it, I felt an overall sense of well-being. I took it in the morning and by lunchtime, when I would normally feel an energy slump, I was ready to keep going." “After taking Pulsate Plus, I have the peace of mind that my health concerns in each of the eight areas (Pulsate Plusfocuses on) are now addressed in one ounce a day!" (Snow Rose), known for its' anti-aging and anti-inflammatory properties, as well as improving circulation. The addition of Larch, Eleuthero Root, Winter Cherry, Buckthorn, and Golden Root completes this blend that helps support the body when under stress. in Pulsate Plus. These nutrients have been used for centuries for their health-enhancing qualities. itself from disease and infection. bioflavonoids to promote a healthy immune system. are vitamin E and blackberry juice extract to support your ability to think more clearly, focus better, and enhance both short and long-term memory. physical stress, and promote healthy release of hormones. The L-Arginine, in conjunction with L-Taurine included in the energy blend, boost the body's natural production of Nitric Oxide, a compound vital to the support and health of the vascular system.